Chapter Three: The Deeds of the Law vs. the Righteousness of God. In this third chapter of Romans, Paul completes his thoughts on the Jewish person whose trust is in the keeping of the Law (humanly speaking, an impossibility), and the conclusion of the matter regarding the whole of humanity and our abject poverty of spiritual virtue. He then proceeds from this examination of human beings and our sinful condition and nature to the blessed hope of our justification (from vs. 21 to the end of the chapter). 1) The aspect of salvation which every Christian initially experiences (that is, one born of God’s Spirit) is justification: the saint is saved from the penalty of sin – death and hell. 2) Then the believer of Jesus Christ goes onto the second aspect of salvation which is sanctification: the saint is saved from the power of sin – living victoriously in Christ Jesus and overcoming the sinful nature. 3) Mid-way through the 8th chapter, Paul touches on the third and final aspect of salvation, glorification: the saint will be saved from the presence of sin – one day being delivered from the corruptible and corrupt body of sin and receiving from the LORD an incorruptible body that has no such sin nature ruining it as these that we presently have are. ~ We have been saved from the penalty of sin: justification. ~ We are being saved from the power of sin: sanctification. 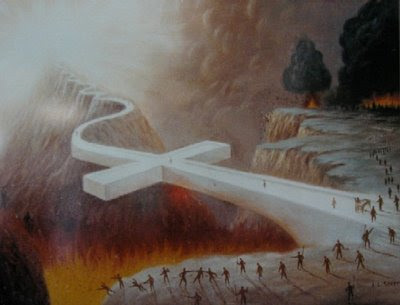 ~ We will be saved from the presence of sin: glorification. The Abrahamic Covenant – this was an unconditional covenant that only required the faith of Abraham and for which God was solely responsible to perform. By faith Abraham was justified. The Mosaic Covenant – this was a conditional covenant in which the participants were likewise to express faith in God, and follow the Law and when they disobeyed were to offer up sacrifices to atone for sin (that covered over, but could not take away sins); the Law and the sacrifices were those means by which Israel, particularly the Levitical priests, were sanctified. The Everlasting Covenant – this also was unconditional which required only faith in the Messiah Who would inaugurate the covenant upon His arrival and saving Israel and bringing her to a position of great glorification and honor. For more information about the covenants of the Bible, check out this video on the web page from The BIBLE Project (www.jointhebibleproject.com). Note: TTUF does not necessarily endorse everything as taught by this ministry. Again, circumcision was an emblem, a sign, a means of identifying believing Israel that would be the recipient of “the oracles of God”. The Greek word used is the same in all references for “oracles” which is logion, meaning: a word, narrative, statement; denotes a divine response or utterance. The contents of the Mosaic Law (ACTS 7:38); all the written utterances of God through the OT writers (ROM 3:2, our present text); the subject of Christian doctrine (HEB 5:12) and the utterances of God though the Christian teachers (1 PET 4:11). One who is given the Word of God has every advantage for being given so rare (and only) a find of truth, one finds insurmountable benefit and blessing – if such is handled correctly and properly used. Where the Jew went astray was in attempting to justify themselves by the keeping of the Law, whereas the proper use of such was to reveal the holiness of God in comparison with our sins and need of repentance, grace and mercy from God. Paul goes on to explain that the very thing that the Jewish people leaned upon for their salvation only worked to prove their guilt (as he will demonstrate later). Here is a mixed multitude such as those that left Egypt in the Exodus, but I’m not making a distinction between Egyptians and Hebrews here; rather the distinction here lies between believing Jews and non-believing Jews. In the days of Moses, he delivered the Hebrews from Egypt, but he couldn’t deliver Egypt out of the hearts of some of the Hebrews! And to love him with all the heart, and with all the understanding, and with all the soul, and with all the strength, and to love his neighbor as himself, is more than all whole burnt offerings and sacrifices. Yet those who hold to religious externalism with dead works, rather than a vibrant relationship with the LORD with a living faith – these will not make “the faith of God without effect” but will rather incur the judgment of God as He declares to them: “I never knew you” (LUKE 13:27). The terribly flawed reasoning of some, according to Paul is that if God’s grace is magnified when it is extended to those unrighteous ones who commit lies and evil, why shouldn’t we excel at such things so that God would be all the more magnified in His offerings of grace? And if such grace is extended, why then should God judge and thereby take vengeance upon such lies and evil? Admittedly the people of Israel in Moses day had a great revelation of God’s authority and power and oracles; believers in the days of Paul likewise had incredible revelation in the newly inspired Word that was even then recorded, being scribed on parchment and vellum (animal skins); yet each of us have received some form of revelation by means of the creation, conscience and, or canon and we are responsible to respond to such accordingly in believing God and not neglecting Him by unbelief (refer back to ROM 3:3; also MATT 13:58; MARK 16:14; ROM 11:20; HEB 4:11). Unbelief is not the same thing as doubt. Honest doubt is simply uncertainty in matters of the truth, but an uncertainty that the doubter wishes to be removed, so that their faith may be solidly secure. Unbelief tends toward a willful and disobedient rejection of the truth, that will not believe, even when provided with biblical argument that substantiates the claims of God's Word. As people “under sin” that is, under the jurisdiction of sin, and slaves in the kingdom of darkness, we have fallen into a most deplorable condition, so that we are incapable of even seeking God as Adam and Eve did when the LORD came to them in the cool of the evening. We do not understand God, we do not seek Him just as Adam and Eve did not - once they fell into sin, acquired a sin nature and hid from God once He came. Sin is a blinding, binding, wreaking, ruinous, devastating, destructive force that turned a holy cherub into a depraved devil; that turned the noble and innocent Adam into a wretched sinner of iniquity; that takes any and all of man’s seemingly higher and nobler ideals and aspirations and twists and corrupts them until they fall into utter ruin and dark perversions usable by the devil. Sin is such a powerful force of evil that it took no one less than God made flesh to destroy it and its horrible effects! No degree of revelation given to the Jew or the Gentile will avail anything in regards to remedying our sinful nature; such revelation from God will only emphasize the decrepit nature of sin that dwells in us, and make us all the more culpable of our wrong doing. In the vast swells and waves in the oceans of humanity, every single drop is tainted with the miasma of sin – all but one: the LORD Jesus Christ, the Son of Man Who is also the LORD of glory! He alone is righteous. He, the Son of Man is alone in His understanding of God (the Father). He alone seeks God His Father. He alone is the Doer of good. While we as sinners are useless (“unprofitable” or "a bruised reed" MATT 12:20) to a Holy God, the LORD Jesus, the Righteous Branch is One Who was constantly used of God His Father to bring glory and honor to His Name (See JOHN 7:7; GAL 5:19–21; JAMES 3:16). Rather than our voices and words being sources of goodness, and life and encouragement they are full of deceit and death, poison and cursing. We understand that our words reflect the heart that issues them (LUKE 6:45), the veritable “fruit of the lips” is borne from the seed of the sinful nature that’s been sown in our hearts. Who trembles at the Word of God today? Whose heart thunders and lips stammer when addressing the Holy Throne of God Almighty? Who lays prostrate before God, weak and shaking, seeking only His will in a life surrendered to Him and Him alone? Where is the fear of God today? Yet there will be reverence, there will be quivering and dismay on the Day of Judgment, when those that ridiculed God and His Word, whose favorite past time was to mock and jeer at the Scriptures, and the guilt of such blood shedding, and of wanton destruction, perpetrators of misery upon their fellow men who were weaker than they and vulnerable, will be apparent with no room whatsoever for a defense. Every mouth will indeed be stopped and every unredeemed soul will find themselves aware of their guilt before God! We understand that by the Law, whether written in the Book or in our conscience, any transgression of it is a sin of various sorts: a transgression, a trespass, some form of iniquity, etc. The Law in the Garden of Eden was singular and simple: You shall not eat the fruit thereof (forbidden fruit from the tree of knowledge); GEN 2:17. For such innocent beings as Adam and Eve, newly created and given life by the Spirit of God, a state of sin was entirely unknown to them. They had no such knowledge of evil, and so knowledge of good was something indistinguishable from their every day experience. Yet like taking a fish out of water, or a flower from its soil bed, removing these from their environment would eventually bring death; sin likewise separated Adam from his Life-source Who is God (ISAIAH 59:2), and his spiritual life died, followed eventually some hundreds of years later by the death of his aged body. The Law for us likewise is that holy standard in all of its holiness and righteousness, purity and sanctity by which our spiritual legitimacy is measured; by this measure we discover that “no one is justified by the law” and we have no such legitimacy before God. If the story ended here, we would be the most miserable, forlorn beings in the universe, abjectly abhorrent and desperate in our despair. However, the story does not end here! As the gathering darkness of doom surmounted through these chapters, until all is black darkness and bereft of any signs of hope, but rather condemnation – a single beam of Holy Light pierces through, and shines on a lonely cross erected two thousand years ago on the hill known as Calvary (or Golgotha)! “The Law and the Prophets” is the New Testament way of referring to the canon of Scripture we know today (basically) as the Old Testament, and as Paul says, the righteousness of God is revealed by these but apart from (or “without”) the Law. The Law is holy and just and good, but I am a sinner and so that which is holy, just and good cannot help but point the finger of condemnation over my entire life. God’s righteousness must then come to us by a different venue, and that is, not by keeping the Law (or any law or moral code of conduct for that matter), but by simply placing our faith in Jesus Christ and believing on Him. Since all have sinned and fallen short of God’s glory, we have no recourse whatsoever other than this one Way (JOHN 14:6; ACTS 4:12). This faith in Christ Jesus, whose sacrifice for our sins is the ultimate and all-inclusive expression of God’s grace to fallen humanity, is sufficient for salvation. It’s been said before: “Justice is getting EXACTLY what you deserve; mercy is NOT getting what you deserve, and grace is getting what you DON’T deserve”! We deserve eternal punishment – death and hell, for our sins – that would be justice! Yet God loves us and wants us delivered from that terrible, eternal fate. By His Gospel, He delivers to us the promise of salvation and in mercy offers us deliverance from death and hell – and that is mercy! Yet He also grants this marvelous gift to us: eternal life through Jesus Christ our LORD (ROM 6:23), and we can partake of this heavenly relationship where we are privileged beyond imagining by calling God our Father (“Abba” in the Hebrew) – and that is grace! Three words in this passage of Scripture (ROMANS 3:21-24) bear examination, and I refer now to Strong’s Concordance: “righteousness”, “justified” and “redemption”. Also among other religious functions such as almsgiving, prayer, fasting, that is considered right, etc. Justified – This word is used throughout the entirety of the New Testament and is closely related to the previous word above for “righteousness”. “By Christ’s propitiation (an exclusively satisfactory sacrifice), His blood (ROM 3:25) brings justification, being the legal and formal acquittal from guilt by God as Judge, the pronouncement of the sinner as righteous, who believes on the LORD Jesus Christ. In verse 24, ‘being justified’ is in the present continuous tense, indicating the constant process of ‘justification’ in the succession of those who believe and are ‘justified’. In ROM 5:1 this word is in the aorist tense indicating the definite time at which each person, upon the exercise of faith, was justified. ”Justification is gratuitously by faith, subsequently and evidentially by works.” The justification by faith in the grace of God, if it is genuine, will then produce good works (EPH 2:8-10; JAMES 2:21). The Greek word for redemption here is the primary one used in all of the New Testament. It’s the word apolutrosis, and means: “ransom in full, salvation, deliverance, redemption. Lutrosis is a more passive form of this word; using the prefix places a stronger emphasis on the One performing the deliverance, that being God, and God alone Who redeems. To be purchased from the slave market of sin, totally set free, never to be sold again! It is used of forgiveness and justification, redemption as a result of propitiation and expiation; deliverance from the guilt of sins; expresses the liberation both from the guilt of sin and doom of sin, and the introduction into a life of liberty “newness of life” (ROM 6:4). It is used in deliverance from the presence and power of sin, and the reclamation of the body at the coming of the LORD. See also ROM 8:23; EPH 1:7; COL 1:14; HEB 9:15. As mentioned previously, propitiation is a satisfactory sacrifice, and in the case of the propitiation of the blood of Jesus Christ, it is the exclusive sacrifice which alone satisfies a Holy God, for the LAMB that was sacrificed is Himself holy! No other sacrifice was ever accepted to put away sin because no other sacrifice met the criteria of God’s own holiness. By the shedding of blood there is the remission of sins (HEB 9:22; LEV 17:11), but whereas in the Old Testament the sacrifices were only propitiatory in type, that is by representation, the true sacrifice that was to come (ISAIAH 53), the Messiah of Israel, the LAMB of GOD Who would bring the acceptable propitiation or “better sacrifices than these”. For a comprehensive understanding of the propitiation of Christ Jesus read HEBREWS 9. Note in Hebrews particularly how that Christ is presented as the High Priest of the New Testament as opposed to the high priest of the Old Testament: both the Priest and the Sacrifice of the New are superior to those of the Old (vs. 8 – 15). Dr. Scofield’s notes on propitiation. God demonstrates His justice in judging the sins of the world as prescribed, even demanded by His Holiness. God also demonstrates His forbearance by the provision of this Supreme sacrifice, exacting the full judgment on His own Son rather than on humanity, and by so doing, justifies those who believe in Jesus Christ. Being so justified before God, and accounted sinless by Christ’s ministerial victory in the resurrection from the dead, we are now suitable as a habitation of the Holy Spirit (1 COR 6:19). It was in my own life, prior to coming to a saving knowledge of Jesus Christ that I struggled and strove to obtain some justification and acceptance with God, but to no avail. I was desperate to understand how any one could possibly be considered justified before a Holy God. We will get into this in the following chapter and the very portion of scripture that led me to salvation! See also: MATT 26:28; 1 COR 6:11; 1 COR 3:16; 2 COR 5:20-21. Note also that this propitiation is invalid in the individual’s life unless that individual expresses faith in receiving this salvation (All are given a “measure of faith” by God; ROM 12:3. The conclusion, according to Paul is this: that the Law serves its purpose in exposing sin in the heart of the sinner, and having done so, it can do nothing more at all. The Spirit of God convicts of sin, but can effect no changes whatsoever in the heart of the unrepentant. Our justification can only be appropriated, not by the law of works, but by the law of faith in the Word of God (1 TIM 1:5–11,19) and the resulting work of the Holy Spirit in drawing us to Christ Jesus for salvation, which once received, allows the Holy Spirit the efficacy of His ministry within the heart of the regenerated believer. The whole question at the Jerusalem Council as referred to in ACTS 15 was whether or not Gentiles required circumcision for salvation, and the unequivocal answer that they concluded was, No! Peter then goes on to say and affirms that the Jews can be saved by the grace of the LORD Jesus Christ even as the Gentiles are – by faith alone, apart from the works of the Law! And again, our LORD’s own admonition that fulfilling the Law of God could be summarized in loving God with our whole heart, soul, mind and strength, and our neighbor as ourselves (MARK 12:28–34). Such ability in loving God and others with explicit wholeheartedness is something only possible by the Spirit of God Who dwells in the believer! And the doers, not the hearers of the Law/the Word of the LORD are justified before God (ROM 2:13; JAMES 1:21-23; MATT 7:24). The difference being that the Jew would attempt to “do” as the means of justification, whereas the one who places faith in Christ Jesus for salvation is able to “do” as a result of justification. We are saved by faith, and this salvation produces fruit, and that fruit is the outward manifestation of that spiritual reality that’s taken place in our lives, via the spiritual rebirth in Jesus Christ. Thank the LORD that by the salvation that He has brought to us, we are sealed by that Holy Spirit of promise, indwelt by the Spirit, empowered by the Spirit of grace and able to walk with the LORD! Your ‘homework assignment’ is to read 1 JOHN 2. This concludes this study. Next time, Romans chapter Four which furthers the doctrine of justification by faith in this Epistle: Illustrations of Justification by faith in the lives of Abraham and David.